Kpreps.com would like to congratulate Everett Royer for submitting the winning photograph for Week 13 of the Kpreps Friday Night Photo Contest. 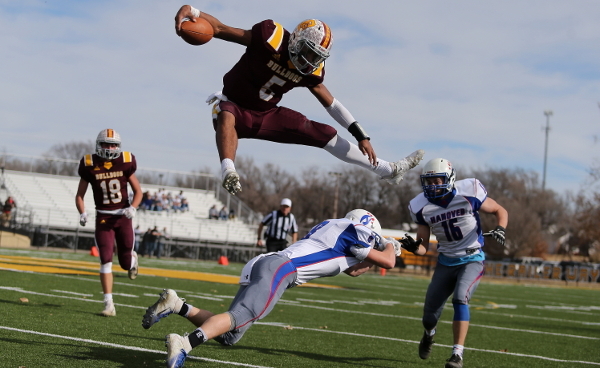 Everett’s photo captures Osborne quarterback Darnell Holloway leaping over a Hanover defender during the Eight-Man, Division II state championship game at Newton’s Fisher Field. Hanover went on to win the game 58-50 to claim its third consecutive state title. Everett was also named the weekly winner back in Weeks 3, 4, and 11, so this photograph provides him another photo that is eligible for our 2018 Grand Prize including $500 in cash.